things like NPK (Nitrogen, Phosphorus, Potassium), pH levels, organic matter and trace minerals in soil was well outside my ease of understanding. pH levels, or the acidity/alkalinity of the soil should optimally be as close to neutral as can be managed (7.0 being neutral). 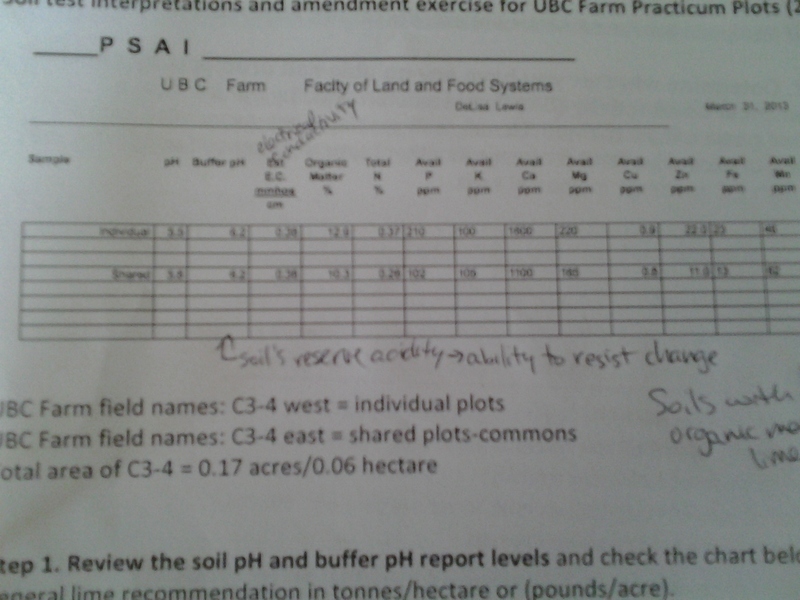 On the BC coast, soils tend towards acidity, so lime is applied to raise the pH level for most of the crops we grow, which are not native to the area. Organic matter is very important, and especially so in sandy soils like those at UBC Farm. 10% or higher is good, and will aid in retaining nutrients and water for the crops. Poultry manure is high in phosphorus, and used by most organic farmers as fertilizer for their soils, which can result in excessively high phosphorus levels, which can have a negative effect on aquifers. Organically approved amendments can be used to change the various levels of nutrients in the soil as needed. One of the important things I’m coming to understand is that farming, even organic farming, requires a lot of off-farm input, that may often come from less than ethical or environmentally friendly. Lime is mined, which always has significant environmental implications, and around here comes from Texeda Island, which isn’t too far away. Poultry manure may be sourced from factory farms, which obviously carry high environmental and ethical implications. Everything that is trucked in from off the farm obviously has a carbon footprint associated with transportation, and is often packaged in plastic. And of course, everything costs money, and when you imagine a farmer starting out, money is in short supply. 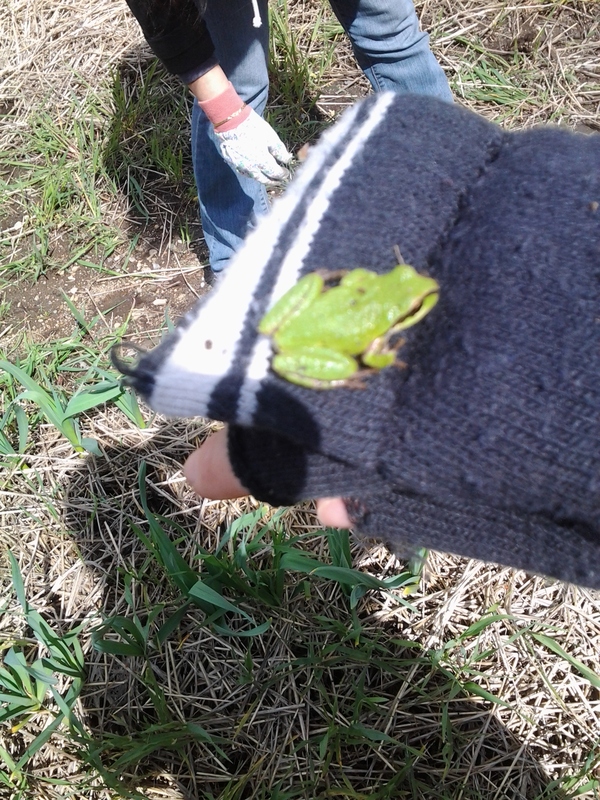 Always going in my head are questions about what can be used as alternatives, how can native species that are adapted to our soil and climate be integrated, and what part can permaculture, livestock integration, and on-farm composting play? These are not questions I have answers to, and don’t expect to be able to answer, but as long as they are always a part of my learning, I hope to be able to integrate some of all of it into my future farm. The 12 weeks of my social media course, with the different blogging assignments and tasks, have given me a little bit of insight into the world of blogging. Given my blog focus, it has helped me learn a bit and explore how non-profit organizations can use blogging to good effect. The best blogs in the environmental sector provide timely and useful information to their readers, offer tips and advice for taking action, and empower people to become advocates. The best environmental blogs that I’ve found so far are the ones that provide the kind of information I’m looking for, whether that’s learning how to start a worm compost or wondering what a good alternative to dry cleaning is. These are great because I usually find them when searching for specific information I need, and blogs usually offer a personal touch, like someone who has tried something in particular. With so many questions about different environmental topics, blogs are a great way to get the perspective of someone else who has had the same questions. There are lots of blogs out there offering great tips and advice to people looking to make a green move. For many people who want to lead a greener lifestyle, the hardest part is figuring out where to start and how to do it. The Clean Bin Project is a great resource for all kinds of waste reduction tips. With sustainable lifestyle changes, as with anything else, people need to feel empowered in order to be able to accomplish anything. The two points above help people to feel that they can make actionable changes in their lives, and this kind of empowerment leads to more long-lasting change. I think, in this sector, blogging is a very powerful tool that is already being used widely to connect the environmental movement. And as a field that always changing, it can only benefit from more people joining in the conversation, and organizations in this area can harness this to position themselves as experts and resources, for the benefit of all.